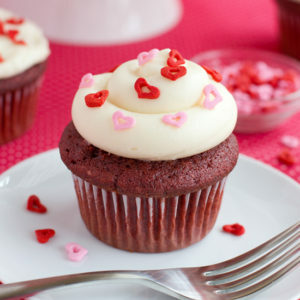 Classic red velvet cake made into individual cupcakes... topped with a thick cream cheese frosting. Preheat oven to 350 degrees. Line one muffin pan with liners, set aside. In a small bowl, combine sour cream, buttermilk and vinegar, mix together. In the bowl of a stand mixer, cream butter, sugar, vanilla and food coloring until light and fluffy, about 2 minutes. With mixing speed on low, add eggs one at a time. In a medium size mixing bowl whisk together cake flour, cocoa powder, baking soda and salt. With mixing speed on low gradually add dry and wet ingredients, alternating one at a time. Continue mixing just until the batter is smooth no flour pockets remain. Scoop batter into prepared muffin pan filling liners ¾of the way full. Place in the oven and bake for 18-22 minutes or until the tops spring back and a cake tester inserted into the center of a cupcake comes out clean. Remove from oven and allow to cool in pan for 3 minutes before transferring to a wire rack to cool completely. Meanwhile to pepare the cream cheese frosting, using the paddle attachment cream the butter, vanilla and salt for 2 minutes or until light and fluffy. With mixing speed on low gradually add the powdered sugar, beat until it forms a fondant-looking ball. Add cream cheese and mix on the lowest speed possible for 1½ minutes, then STOP! Place in refrigerator to chill for at least 15 minutes or until cupcakes have completely cooled. Allow to stand at room temperature for 5 minutes before placing in a bag to pipe on cupcakes. Top cupcakes with desired sprinkles. -This recipe easily doubles to make 24 standard size cupcakes.